The cream is obtained by centrifuging the milk at high speed; density relatively minor, it collects at the center of the centrifuge and from here is made to flow outside, while the milk is collected by other way. A creams have a short shelf life and should be kept in the fridge. Clotted cream (sometimes called Devonshire, clouted, scalded or Cornish cream), is very rich cream (fat content 55 per cent) is a speciality of south-west England. 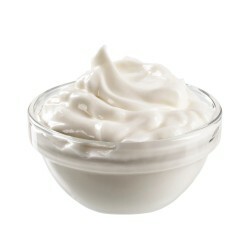 Whipped cream (Aerosol cream) has a recognisably creamy and slightly sweet taste. Cream that has been treated at an ultra-high temperature to preserve it (UHT cream) is whipped and packed into aerosol containers with stabilisers and up to 13 per cent added sugar; a gas propellant under high pressure is added to expel the cream. Crème fraîche is a French ingredient and the best comes from a strictly controlled area of Normandy. It is made by leaving fresh cream from pasteurised cow's milk to mature and ferment through the action of natural bacteria. Soured cream (also called sour cream) is produced by inoculating pasteurised and homogenised single cream with starter cultures of bacteria to convert the lactose into lactic acid. Double cream is an UHT (ultra-high temperature) treated long-life cream staple in Italian cooking, particularly in sauces. The cream, depending on the type, has different uses such as: added to sauces, soups, savory and sweet dishes, a main ingredient in ice creams and other desserts; as a topping for fruit, drinks, cakes, puddings and breakfast cereals. "Enthusiasts of information technology and good and healthy food, our mission is to become the best online shopping site in the world promoting the small food makers and craftsmen of taste in the sale of healthy, natural, handicraft, local and organic food and drinks". Help us to reach our vision, buy online delicious food to our e-commerce with home delivery. Subscribe to Foodgenuine's newsletter to get exclusive benefits, offers and more info about genuine and healthy food for your body!